Sequences continue even after a person responds? Is there any way to have a sequence continue - even if a person responds to an email? We have a sequence set up to teach people about a purchase they just made, but when they respond, the stop the traning emails from coming. We'd like them to continue on if possible. When you enroll a contact in a Sequence, that Sequence will immediately execute the first step. The contact replies to one of the emails in your sequence (note: the sequences tool detects automated out-of-office replies from Gmail or Outlook and they will not cause unenrollment). The contact sends an email to you from an alias of the email address enrolled in the sequence. This activity will not appear on the contact's timeline. The contact sets up a meeting with you or a member of your team using the meetings tool or a meeting has been scheduled with the contact. The contact is manually unenrolled from the sequence. To unenroll a contact, follow the instructions below. The contact's email address bounced, likely due to an incorrect email address. Please note: deleting a sequence will not unenroll active contacts from the sequence. If you'd like to prevent any further steps in a sequence from executing for a contact, they will need to be manually unenrolled. In your HubSpot Sales account, navigate to Contacts. Search for the contact you want to unenroll and click the name of the contact. On that contact's record, click Unenroll next to the enrolled in sequence alert beneath the contact photo/avatar. 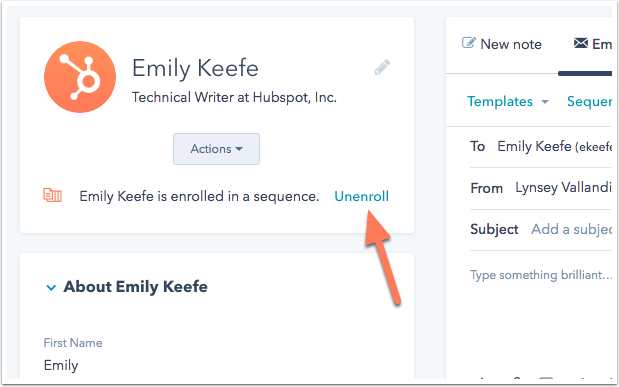 In your HubSpot Sales account, navigate to Sales Tools > Sequences. Click the name of the sequence from which you'd like to unenroll your contact. Click the Actions dropdown to the right of the contact you'd like to unenroll, then select Unenroll. Within Gmail, compose a new email. In the To (recipient) field, enter the email address of the contact you'd like to unenroll. If you have Contact Profiles in Gmail enabled, you should see the HubSpot Sales Sidebar appear. If your contact is currently enrolled in a sequence, you'll see a box that says Enrolled in sequence. Click Unenroll from sequence to remove the contact from the sequence. I am not trying to be "smart" here, but looks like an auto response? The question was not addressed. We would also like the flexibility to designate some sequences as continuing even if the customer responds...thanks! Just to clarify it is not possible for a contact to continue on in a sequence after they respond. You could accomplish this by enrolling them in another sequence. As the success of a sequence is based upon the contact replying to an email, that is the purpose of the sequence. Thanks for the explanation and summary, aoifemoon! Agree, we need a setting to force the continuation of sequences even if they clicked a link or sent an email. We also use sequences for "drip training" where a client who recently purchased receives the training 1 email at a time. The trainings include links to learn more, media kit, referral, etc. and we don't want the sequence ending because they click one of the links. Just curious, why wouldn't you use a workflow for this instead? We also do training emails, but we deliver ours through a workflow based on time passed/if an email was opened. I would actually like to know if you could stop a sequence from continuing if the current step isn't completed? Currently, the sequence will continue even if the first step has been completed. Salesloft has this option. Also, gmail does allow embedded links so not sure why you don't allow this in emails. I'm tired of having to send emails out of Gmail just so I can't get my link in there. You guys have a way of doing everything backward when it comes to needs of salespeople.